This easy slow cooker turkey chili is perfect for busy weeks. Just set it and forget it while you get on about your day! It’s naturally gluten-free and dairy-free as well! I haven’t forgotten about you friends! I promise! I’m back with an easy crockpot recipe to warm you up in this cold weather! The past few weeks have been a bit crazy to say the least. We’re in our busy season at work so creating lots of new recipes hasn’t exactly been on the schedule. I’ve been very much in the quick and easy meal mode to get me through the work week. My crock pot has been in full force and big batches of soup, stews and chilis have been abundant. Then I thought to myself.. “Hey MEG! Stop being a NUT! These people are busy too! Give them an easy recipe to fill them up all week!” Well.. duh. Thanks inner Megnut for that advice. It was almost another quiet week around here! I mean we’re all busy people. I get it. I work a full-time job and also love to bring you these recipes at night. It’s not always easy and I don’t always have time to elaborate meals (actually like never). In fact, if you’ve been following my blog long enough, you probably know how my meals are made each week. I cook on Sundays and reheat throughout the week. Occasionally we’ll make something new during the week but it’s rare. So easy recipes like this slow cooker turkey chili are my figurative (gluten-free) bread and (non-dairy) butter! This is an effortless turkey chili that takes minimal preparation and you can just throw everything into the crock pot, set it and forget it while you get on about your day. That’s what I love about it! And of course we can’t forget the taste. I asked my red meat loving boyfriend if he liked this turkey chili more than the beef chili I make (which is pretty darn good if I do say so myself) and he answered with a resounding YES! I think the slow cooker just brings out all of the flavors and makes the turkey so moist that most people wouldn’t even realize its ground turkey in there. This slow cooker turkey chili is definitely my new go-to meal for busy weeks! It does not get any more comforting than this hearty slow cooker turkey chili recipe made in your CrockPot. 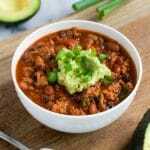 Filled with lean ground turkey, beans, tomatoes, peppers and a delicious tomato sauce, you’ll love how easy this turkey chili is to throw together for meal prep or easy weeknight meals. It’s also gluten-free and dairy-free, making it great for those with Celiac disease, gluten intolerance, and lactose intolerance. Dinner doesn't get much easier than this slow cooker turkey chili. Just throw everything in the crock pot, set it, forget it and a delicious gluten-free and dairy-free meal is served. Top with guacamole and green onions for extra flavor. In a skillet over medium high, heat oil. Add ground turkey and cook unill browned. Add the diced onion to the skillet and cook for 3-5 minutes, until softened. Stir in minced garlic and cook an additional minute. Add turkey, onion and garlic to the slow cooker. Then add remaining ingredients. Stir to combine. Cook in the slow cooker on low for 4-6 hours, stirring occasionally until the chili is hot. Adjust any seasonings as needed. Top with guacamole and chopped green onions to serve. This chili looks so warm, filling, and hearty. I love that you made it in the slowcooker! Chili is always a must right now!! Yum! Love, love, love slow cooker meals, and this chili looks so hearty and de-lish! I need to try that easy guac recipe too! I seriously need this chili in my life!! i’m ready to dig in! I love using a slow cooker for chili! Such an easy meal! LOVE the guac on top!